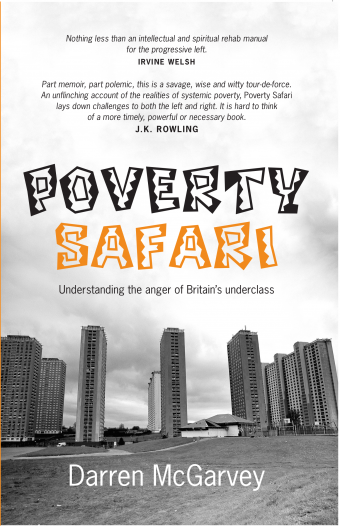 Book Review – Poverty Safari by Darren McGarvey, (Luath Press £7.99) reviewed by Jim Monaghan. Darren McGarvey’s publishers make a very bold claim for this book, that it is the articulation of the voice of the misrepresented and misunderstood, the angry underclass and disenfranchised. It is in fact, three things, it’s a personal story of the authors rise from a dysfunctional home and social background. It IS, partly, what the publishers claim – an explanation of the anger of the “underclass” but its also a manifesto for change, an attempt to frame what McGarvey thinks is a new way of doing things. To me, it succeeds in the first two but falls short on the third. As a personal story it is harrowing at times but uplifting in the end. McGarveys traumatic childhood set the tone of his teen years and early adulthood, he took a path that was laid out for him. 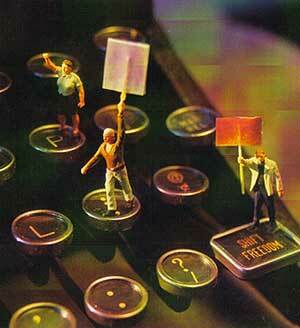 Like so many working class people the idea of choice and making your own way in the world was an alien concept. The expectations and aspirations of a “schemie” can be, in many cases, decided before you are even born. The author articulates this well in his own personal story, gradually becoming a mirror image of the older generation he had thought he had rejected. Even when he broke through as a young rapper and social commentator on national radio he was living a double life, away from the stage, a reckless alcoholic bent on self-destruction – repeating the mistakes he had seen others repeat generation after generation. But his rise from the doldrums to a level of self-awareness that enabled him to change his own life is an enlightening and, at times, inspirational story of personal redemption. It’s that personal redemption that leads, in my mind, to the part of this book that fails. His “manifesto” for others – that personal change and responsibility will change the world rather than political campaigning and activism – isn’t a new idea and its part of the modern individualism that got us where we are as a society now. Nice, socially responsible individuals, can often be happy to accept things as they are, dysfunctional activists are often those who get things done and create a better place for others. Contradictions are rife in this book and McGarvey doesn’t shirk from admitting them. He rails against authority figures and organisations yet, the experiences he cites when he does engage with them are mostly positive. From his anger-management psychologist as a teenager, through to the community groups he works with are all positive influences on his life. He admits making the same mistake with Ellie Harrisons infamous “Glasgow Effect” – lashing out at what he saw as a middle-class artist on a “Poverty Safari” and, after allowing himself to look at the project, admitting that he was wrong. Yet he still makes the same mistakes, referring to “well-meaning lefties” in the “poverty industry” which he claims is in a state of perpetual growth. This is a view often repeated in right-wing press and a view taken by those let down by agencies. The reality is that the “poverty industry” he refers to is a skeleton remnant of a once vast network of support agencies, from Social Work and Community Education through to Social Inclusion Partnerships, Labour Exchanges and Job Clubs have been decimated over decades and is still in decline. Those that remain to pick up the pieces exist as a tiny fraction of what went before, facing an uphill struggle to assist people who are the victims of this decimation. But, despite some shortcomings, this is a powerful book, an important book, engaging and witty, thought-provoking and challenging. Darren McGarvey is uncompromising at times, but is always willing to examine his own attitudes and viewpoints. In that aspect he is bolder than most writers out there, who would mostly never admit to being wrong. It has been a feature of his recent work that he is willing to change his mind and offer his own shortcomings as an apology. That’s what makes him one of Scotland’s most important writers. This won’t be his last book, it reads like an introduction, a forerunner for more to come. I hope that is the case, as soon as I finished Poverty Safari I immediately wanted to read more. Poverty Safari by Darren McGarvey is published by Luath Press, released on 04 November 2017. Pre-order here. We are holding our annual fundraising appeal to try and raise £35,000 to continue and develop Bella Caledonia. If you value this site we need your support to continue. Well the review makes me want to read the book, so that’s a good review, made all the better for my wanting to read it because I can’t believe the review is right. The book surely isn’t advocating that “personal change and responsibility will change the world rather than political campaigning and activism”? Us each taking personal responsibility for changing ourselves and the world for the better (rather than just sitting back and criticising) has got to be the way to go, but that personal responsibility is the ground of activism, not an alternative to it. I enjoyed the review; well written, good stuff. Thank you, Jim! Some of what McGarvey (AKA “Loki”) writes gets on my wick, maybe because I spent some time working in the “poverty industry” as McGarvey calls it, and don’t like to hear what he has to say. I made a good wage and had a nice life style, so maybe I’m a bad guy. Maybe the council should have given the job to a local man instead of me? Maybe McGarvey could have done it? It was a piece of piss working with Europe’s most deprived & damaged children and their abusive (and equally damaged) parents. Nearly cost me my sanity. But he seems to be someone with curiosity and intelligence which makes what he has to say interesting and enlightening. Plus, who else is writing from his perspective?